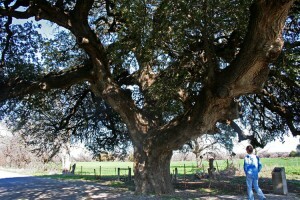 Update: We visited Wedding Oak Winery again and the famous Wedding Oak tree after they opened. Please be sure to read the latest here. 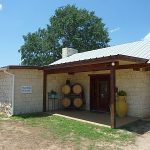 San Saba Wine Cellars (now officially renamed to Wedding Oak Winery) is located in the town of San Saba and is managed by Mike and Lynn McHenry. 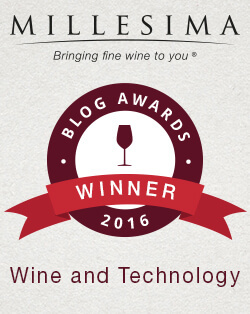 Mike is the General Manager/Managing Partner for their group of investors who all happen to be wine aficionados. The winery is scheduled to early June, but we got an invitation by Mike and Lynn to visit the winery in advance. 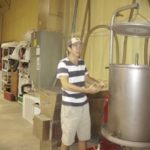 I have been following their well-documented website and Facebook page with the construction of their winery and it looked like it was going to be very nice. From looking at the photos in advance, the tasting room building was making good progress and the production facility next door had a concrete slab poured and steel girders installed to begin the construction of the building. Mike McHenry told me to call him when we got close to San Saba and when I called him, he said to meet them in the bank building across from the winery. We arrived and Mike greeted us as we were parking in the back of the bank. He took us inside where we met his wife, Lynn. They explained we were meeting there because the winery was still under construction, but they would be giving us a tour of the winery. We stood across the street from the winery and they explained the buildings which would comprise the winery. Facing the winery, they actually bought three unused buildings and are in the process of renovating them. The middle building was a 1926 commercial building and will be the tasting room. The left building built in 1910 will be leased, and the right building was torn down. In its location they are building the 7,800 square foot production facility for the winery which will contain a barrel room, tank room, and allow special private tastings. The new building will be designed on the outside as if it was built years ago to fit in with the decor of the street. In fact even though it will be one large building, it will look like two buildings from the outside and even looking in the windows, the viewer will think they are two separate buildings. Mike stressed keeping the history there was very important and the story is almost as important as the wines. As we walked across the street, we learned the McHenrys have been growing grapes for 11 years in their four acre vineyard called Cherokee Creek Vineyards. All their previous harvests have been used by Alamosa Wine Cellars. 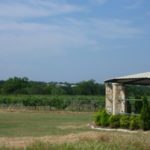 They decided by using their years of growing experience, it was time to open a winery and the town of San Saba with its classic, early 20th century historical structures made a perfect location. We went around the back of the building since that is where customers will most likely be entering. The front of the winery is just street parking but in the rear is a large city parking lot. 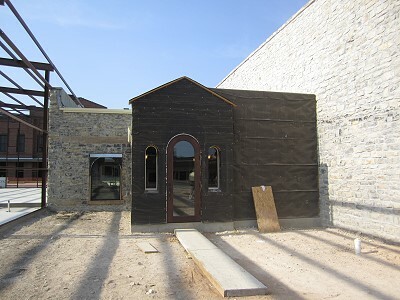 The rear of the winery will also have a courtyard where customers can enjoy a glass of wine. Walking into the rear of the winery from the courtyard will be a kitchen to the right where food such as cheeses can be purchased. 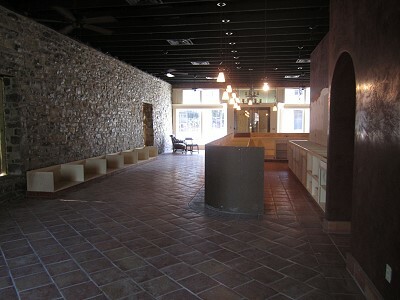 The winery’s tasting room is a beautiful display of workmanship with the stone arches and walls. 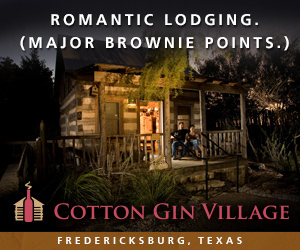 Mike said the tasting room was designed so a customer would have a feeling they could be in Texas, Italy, or anywhere in the world. They could look to the rear door and see the courtyard, to the front would be the historic buildings, and there will be two windows looking into the barrel room. The tasting room will have a television showing video loops of the winery’s construction, the vineyard, and other items to give interest for the customer. The winery will have a wine club called the 300 club which will be a unique club. To become a member of the limited club of 300 members, all you have to do is buy two cases of wine the first year, three cases of wine the second year, and so forth. The members will receive a bronze plaque with their name which will be installed in the winery, hence becoming part of the history of the winery. 300 club wine members will get special tastings in the barrel room with their membership. Even though the winery has not opened and no wine has been tasted, Lynn said they already have 30 members. There will also be another wine club which is the case buyer’s club and all you need to do is buy one case of wine and you’re in. As mentioned, special tastings will be held in the barrel room and Mike jokingly said when customers are in the tasting room, they’ll wonder how they can get into the barrel room for the special tasting taking place. The tasting room is close to completion and Mike said if the counter top for the 43 foot long tasting bar was in place, we would be doing a tasting there. We walked into the production facility, or what will soon be the production facility. Right now there are just steel girders framing the outline of the building. Mike said the equipment for production will arrive in June. There will be 14 tanks with storage of 21,000 gallons. The production facility will have the capacity to produce 10,000 cases of wine a year. They have already made 1,256 cases of wine and initially they are expecting to make 3,000 cases of wine a year. French oak barrels, one time used, are already waiting in California for delivery. Besides producing their own wine, they will have the ability to do custom crushing for others. They plan on starting to crush their own fruit this year. 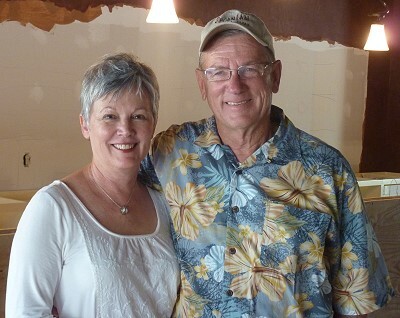 Mike and Lynn were proud when talking about their winemaker, Penny S. Adams. 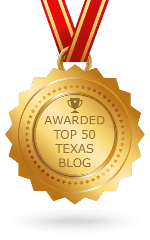 Penny graduated from Texas A&M and is the first Texas woman Wine Master. 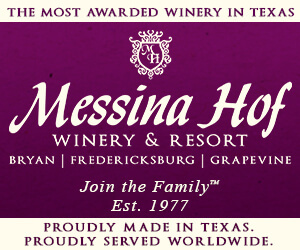 She also is one of four viticulture advisors for the state of Texas and covers the Texas Hill Country. Other viticulture advisors in the state are Fritz Westover for the Gulf Coast, Dusty Timmons for West Texas, and Fran Pontasch for North Texas. I can see why the McHenrys are proud of their winemaker. July 13th through the 15th will be an event for the new wine trail simply called a Beach Party. The building was impressive, the plans sound great, but the real question now came down to, “how good is the wine?” We went back to the bank building and Mike started a tasting for us. He informed us all the wines so far were made at McPherson Cellars. Their winemaker Penny Adams has known Kim McPherson for a number of years so they collaborated on the initial wines for San Saba Wine Cellars. The first wine to taste was a Viognier which of course was very good. 224 cases of Viognier were made. While tasting, Mike made a point to indicate they would be taking the best possible grapes and making their wine the best possible way. The county used to be a dry county until recently so that makes it easier for them to open. 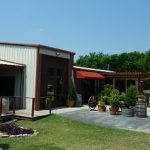 Speaking of opening, they will be opening with a beer and wine license because the winery isn’t finished yet, so the TABC will not issue a winery license. The beer and wine license will allow them to do tastings and let wine be bought at the winery much like a bar. However, it will not allow them to do things such as ship wine. The completion of the TABC license may not happen until September. The next wine we tasted was a 2011 Wedding Oak White made of Vermentino, Trebbiano, and Pinot Grigio of which 224 cases were made. 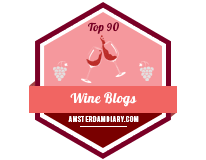 We fell in love with this wine! 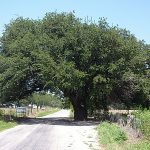 The name Wedding Oak came from a historic Wedding Oak tree in San Saba located just northwest of the winery which has served as a symbolic marriage site for over 400 years. 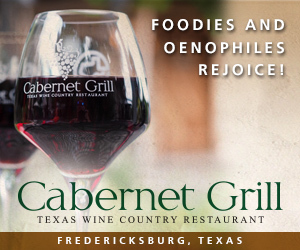 Their Wedding Oak Wines reflect the union of Texas wine grapes with Old World winemaking styles. The next wine was the 2010 Tioja. This contained all Texas fruit which was bottled in January with 392 cases and it contains 60% Tempranillo, 20% Mourvèdre, and 20% Cabernet Sauvignon. Once again it was another great wine. Next was a Sangiovese which was made with Texas fruit from Kim McPherson’s father’s vineyard, “Doc” McPherson’s Sagmor Vineyard, which got its name because the original trellis wires sagged noticeably. 192 cases of this was wine made. Last to taste was 2011 Wedding Oak Bridal Blush. There were 224 cases of this wine made which consists of Chenin Blanc, Muscat Canelli, Orange Muscat, and just one percent of Ruby Cabernet for the color. Oh yes, it was another great wine. They said there are weddings which will be happening soon and the wedding parties wanted to get this wine and the Wedding Oak White to serve at their weddings. It is rare when we walk out of a winery and like all the wines, but that is what happened in this case. 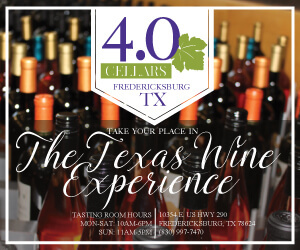 We tried to come away with buying some cases of wine, especially the Wedding Oak White, even offering a donation, but again due to the TABC rules it was not possible. We were able to come away with a cork though which will tease us until we get to drink their wine again. 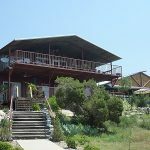 Lynn and Mike invited us to visit again when they are open and if we do not make it soon, the 2012 San Saba River Pecan Jam in October is now on our calendar. Unfortunately the winery is a distance from where we live, but they are planning on having a fixed cost shipping rate for cases of wine which will make it very nice to get wine delivered. 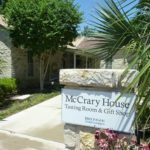 We thanked Lynn and Mike McHenry for their hospitality and drove away very happy there is going to be a great Texas winery opening up soon. 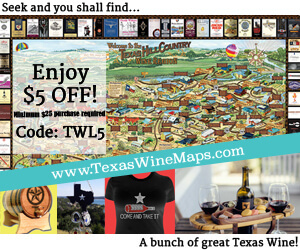 San Saba Wine Cellars is currently on the Way Out Wineries wine trail. I have never had your wine but was at a tournament in San Angelo,this past week. There was a bottle on the pro’s desk. I noticed it had no Sulfites. Seems if there are sulfites, my hands and joints hurt. Do you have a price list and do you ship. I could talk to M & R Liquor in Amarillo to see if they would contact you, unless you already have it in Amarillo somewhere?